Is there anything better than summer fruit?! (That was a rhetorical question – there isn’t.) With berries, plums, and peaches galore, fresh recipes (and snacking) are endless. Our newest summer obsession? Peach jam. You guys loved our low-sugar cherry jam recipe, and now we’re moving onto the next wave of summer fruits – peaches being one of them. 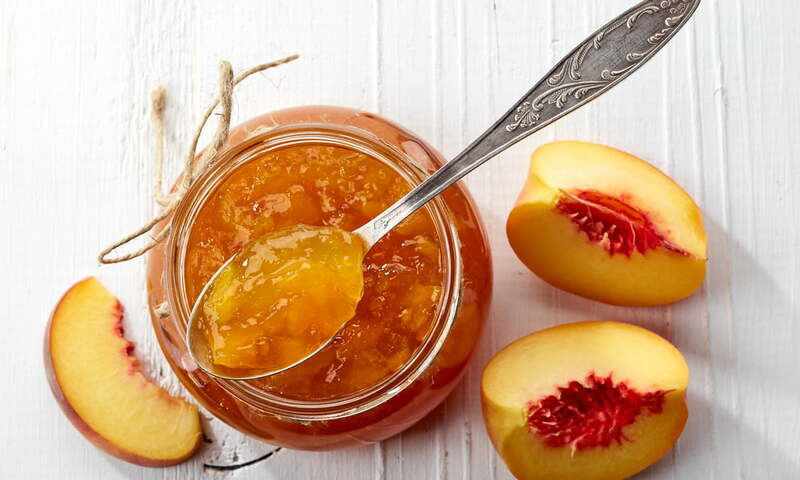 Peach jam is a nice alternative to two of the more popular jams, raspberry or strawberry, since it’s on the sweeter side, goes well with a wide variety of foods, and has no pesky seeds (your teeth will thank you). Peach season is just beginning, so if you take note of this recipe, you can have fresh peaches and jam all summer long! Most fruit jams are made with pectin for thickening, but fruit jam can also be made without pectin and instead with fresh fruit, lemon juice and sugar to create a similar effect. Pectin, a naturally occurring substance, requires larger quantities of sugar to thicken. Since this recipe doesn’t have pectin, it doesn’t need as much sugar. That being said, it might be a bit looser and less vibrant in colour than jam with pectin in it – but it’s still delicious! Place peach slices in a large pot. Add lemon juice to peaches and mash with a potato masher. Stir in sugar and bring to a boil. Continue to boil and stir for about 25-30 minutes until jam thickens or reaches 8 degrees F above the boiling point of water (test by using a candy thermometer – use this PDF for reference!). To test the jam’s thickness, use the “cold plate” method. Once thick enough, transfer jam to sterilized canning jars. Cap with lids and bands and ensure that you don’t cap them too tight (until just finger-tight). Process in a hot water bath for 10 minutes. If you are unfamiliar with a hot water bath, check out this site or this one. Enjoy on toast, scones, pancakes, or however you like – it’s great on baguette with some fresh goat cheese or even in Greek yogurt. It’s also delicious with vanilla ice cream. next post: What’s The Fuss About Fuzz: Why Do Peaches Even Have Fuzz? !